Summary: When a baby rockhopper penguin is hungry, his mother goes in search of food while his father stays home to protect him. The mother is part of a group of penguins that climbs cliffs and dives into the ocean, braving sea lion and orca predators, to hunt for fish and krill. Meanwhile, when the baby penguin wanders off to explore, his father must protect him from a hungry skua (bird). Finally, the family is reunited, and baby penguin gets his (apparently regurgitated) meal. An author’s note gives more information on these Antarctic penguins. 32 pages; ages 4-8. Pros: Nic Bishop has another winning collection of nature photographs that will be popular with primary grades. 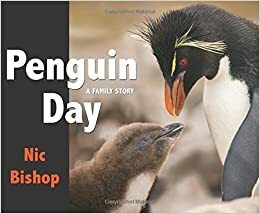 The story will draw them in, and the author’s note can be used to teach more about the penguins. Cons: The story was a bit more mundane than the photos.